A question that is music to my ears: Would you like lean, fatty or burnt ends? It’s not by choice that I love smoked brisket. Apparently I was born this way. Or maybe all that meaty smoke just overwhelmed my taste buds when I arrived here from Louisiana years ago. Some of my favorite blog reading is focused around my obsession with brisket and Central Texas barbecue. These barbecue bloggers know their stuff, and they’re a great place to get advice about the best places to eat and why. Their blog names give you an idea of what their posts are like: Don O’s Texas BBQ, Texas BBQ Posse and, my favorite blog name ever, Man Up: Tales of Texas BBQ. These are the true believers, the aficionados who were chewing the fat (literally) before the recent national fame of Franklin Barbecue in Austin made Central Texas smoked meats trendy to ponder. For years, these guys have put in the miles, taken the detailed photographs, broken down their experiences into spreadsheets and charts. Some of them write for a living, some of them are just dedicated, regular dudes. They all seem to spend the bulk of their spare time criss-crossing the state on their own time and dime, searching out the best Texas ‘cue. One of the bigger debates on these sites is what qualifies or disqualifies a place from being an authentic barbecue joint. It is, for example, considered to be an apostasy to use gas-fired smokers to cook your meat and then merely “finish” with wood smoke for a few hours. True Central Texas barbecue is cooked, from start to finish, with wood smoke, usually “low and slow,” as the oft-cited barbecue mantra goes. And if your joint is only open for a few hours one or two days a week, there are some who say that yours cannot be considered a real barbecue joint– if you don’t have to crank out a consistent product day in and day out, you can afford the time and attention to be “Michelangelo” with your meats. Can’t stand the heat of criticism? Then you’d better back away from that pit and hand those tongs to someone else. The deliciousness and integrity of an entire genre of revered cooking and eating is at stake here. The rustic collection of limestone buildings is spread among the twisted oaks. There are twinkling strings of lights all about. The service is prompt and friendly. I know I am just a barbecue-loving amateur, but I have to say that my brisket was absolutely great, a combination of well-rendered fatty cuts and flavorful burnt ends that were the hit of the table. The Salt Lick likes to paint a little of their unique, mustard-based sauce over the meats throughout the smoking process. 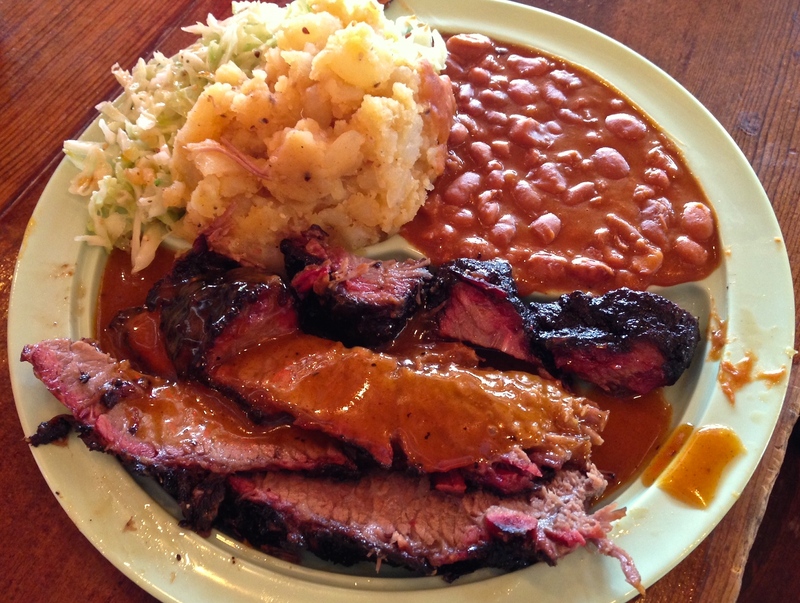 (True Central Texas-style smoked meats are not cooked with sauce.) They also appear to add another little splash before bringing your plate to the table. I look forwarding to eating the brisket there again, sans the extra sauce. The best brisket I ever had was smoked by the local Masonic lodge in Klein, Texas, a several-times-a-year fundraiser. Put your name on the list, order a whole or half brisket. It was smoked right next door to where I worked, and the smell permeated the air the day the day before it was ready. A whole herd of briskets lined up in a humongous smoker that was attached to a flatbed trailer for easy transport. They were delivered to my workplace, each wrapped in smoky, crinkled foil, with a crust so perfect, dark and crispy that I could barely keep from gnawing on it during the drive home. You can’t put that on a top-50 list. I’ve made the pilgrimage to a respectable number of the tasty places on that Texas Monthly list, but I have many more highway miles to log before I can say that I’ve really made a dent. Right now, of the place I have tried, City Meat Market in Giddings and Kreuz Market in Lockhart are two of my old-school favorites. Which brings me to another barbecue debate. If you want to know what Central Texas barbecue is all about, you need to go to the places where it first came to be, the “heritage” meat markets and bbq joints that dot the Texas Hill Country and are the living history of how this style of barbecue began. 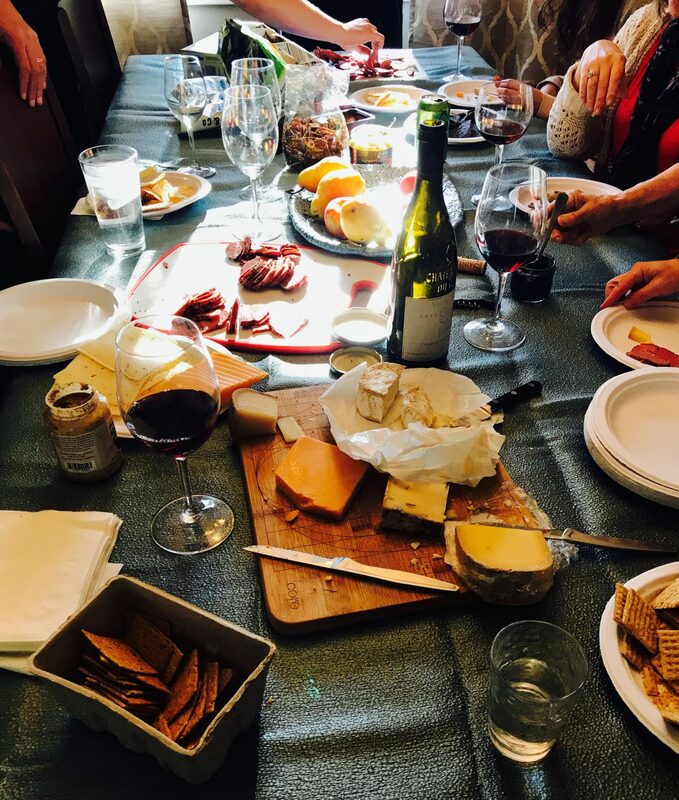 Rather than eat one big meal, get a small sampling at more than one of them. And you need to save the other places, those in-the-media, newer places, for your next trip.